This quilt belongs to Leslie. It is made from a jelly roll. But she's added a bit of a twist to it, by adding in alternating narrower white strips. It is a stunningly beautiful and simple, yet effective quilt. More to follow. 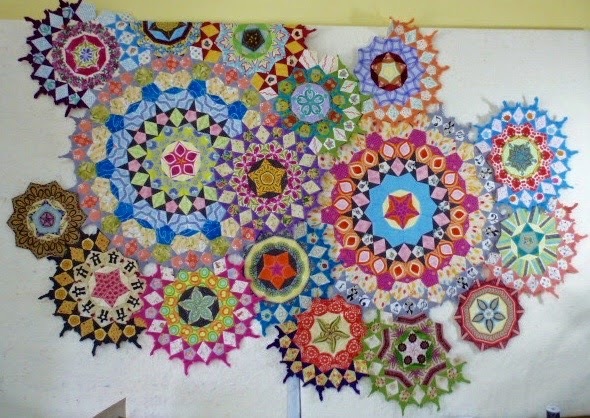 I'm continuing to plug away at La Passacaglia, a design by Willyne Hammerstein in her book Millefiori Quilts. I finished up two small rosette centres, and have finally gotten the arrangement to a place where I really like it. I still have some star points to add to the rosettes I did this week, and then I think I'll tackle the task of sewing it together. I haven't got any place bigger to be able to hang this, so I think, after I get this part of it all sewn together, I'll reverse it, and have most of it hanging down the back, but with the top section of this still hanging down in the front so I can see the intersection of the fabrics that are close to each other. None of the rosettes I did this week count as finished without their stars, so I can't count them. But I did get the last of the Canadiana Row quilt rows done, and the flying geese for the borders are done, as well. So I can count them as fabric out. So close...... so close to being back in the black, so to speak. Unless I get weak or tempted in the coming week, I will be back in the black. I'm linking up to Judy's Stash Report, Angie's WIPs Be Gone and Kathy's Slow Sunday Stitching. 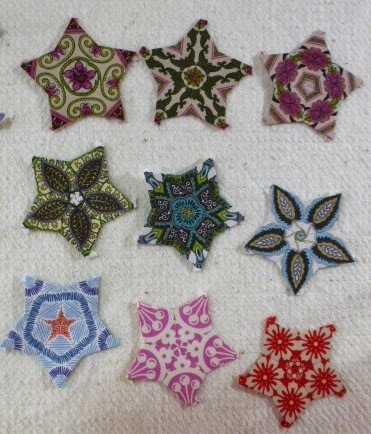 After that, it will be time to pick out some fabrics for the star points. So much fun!!! I haven't done a sneak peak post in ages. It's ice pelleting outside but it's bright and cheery in here. I'm working on finishing Alice's quilt. 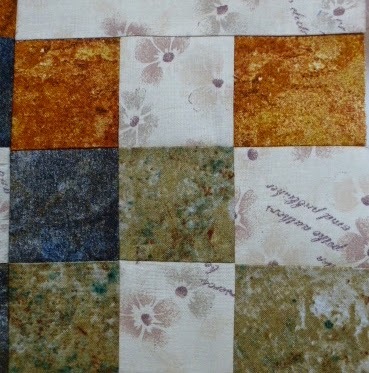 It's a one block wonder out of gorgeous fun fabrics snd colours. Lots of straight lines and ruler work and thread tail tying and burying. A couple more hours should finish it. I'm working on the last row for the Canadiana Row Quilt we are doing for the guild. This last row, rather than providing a pattern, was to represent what each individual thought represented Canada for them. The first thing that came to my mind was our national anthem, "Oh Canada", therefore that's what I've done. To make it even more personal for myself, one of the background fabrics has sewing notions on it, and the other has fishing gear on it. I'm not really big into fishing, but it was the closest I could come to outdoors and camping and hiking. All that is left for this project is to sew this into the body of the quilt, and then do up the 98 flying geese required for the borders. I would really like to have this done by the next guild meeting so that I can take it with me and show them the finished product. So, with that in mind, I'll link up to Judy's Design wall Monday, and then go get a start on those geese. I've gotten a few more rosettes done for La Passacaglia. 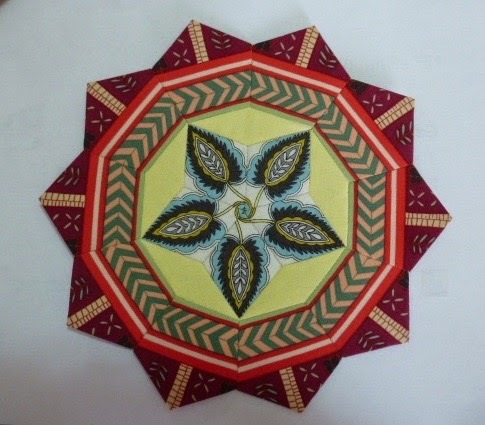 I should mention that this design is from a book called Millefiori Quilts, by Willyne Hammerstein. 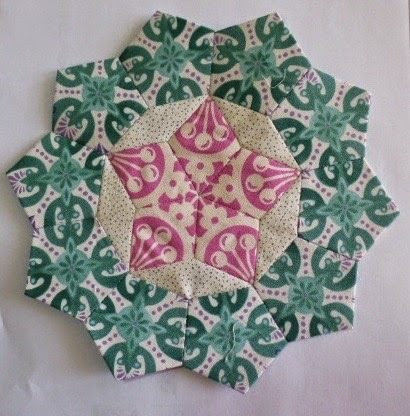 This is the rosette I'm currently working on. It has two more stars to go onto it, and then I can call it done. I am seriously considering doing some re-arranging, so that I can get that little dark one to fit in better. I put it, and the almost finished one beside each other down at the bottom, and they seem to play fairly well with each other there. I'm thinking of using the blue stars to go around that dark one. The colours in this picture aren't quite true. It's a smidgen on the yellow side, but I don't seem to able to get it corrected. Here's a closer picture of that dark block that is having such a hard time playing nicely with the others. It is actually sitting on top of another rosette that was made using that blue colour, but I can find another place for it. This combination seems to work better. There are enough grey tones in these three blocks that they work better together. Due to my continuing fixation on this project, the stash numbers aren't changing very fast. All I can count as out are two rosettes that got finished his week. I'm linking up to the usuals, Judy's Stash Report, Kathy's Slow Sunday Stitching and Angie's WIPs be Gone. What does the frog say?!?! So, the organizing started yesterday continues. But I’ve taken a brief rest from making a mess in order to clean up… why does it always make a mess to clean up, by the way? During this little break I decided to work on La Passacaglia for a little while. I’ve started sewing on some blue stars onto that dark on on the right hand side. But the longer I look at it, the more I don’t like that particular rosette. It’s too dark, and not like anything else in the piece. So, I think I’m going to take off the blue stars that I sewed on in hopes of lightening it up some, and put something else there. In the meantime, there’s been a little movement out of the stash. There is an unintended down side to doing all this little bitty pieces in hand sewing… it takes forever to get any size used numbers. Oh well… I’m continuing to have fun, even if I do have to do a little bit of unsewing. I can use the blue stars on another piece, so it isn’t a total loss.In fact, I like the way the blue looks on the rosette right beside that awful dark one, so maybe I’ll use them there. 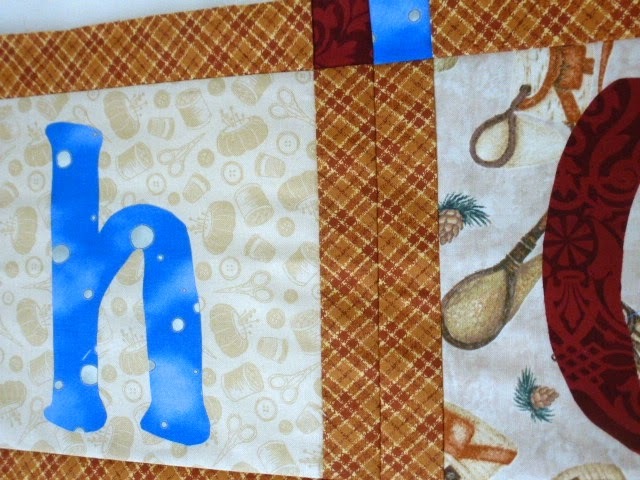 I’m linking up to Judy’s Stash Report, to Slow Sunday Stitching and to WIPs Be Gone. and there will most certainly be more of them, I will have all my fabrics and scraps sorted according to colour, and it won't be anywhere near as hard, or as messy, to find the perfect fabrics. 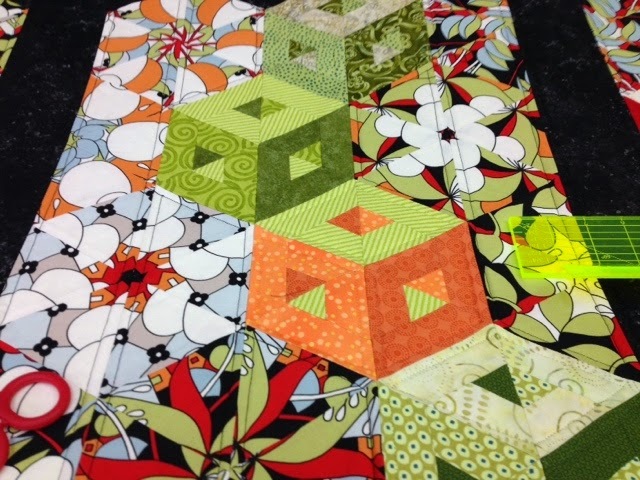 Oh, and the workshop..... it was done by Jennifer Houlden, who has a website at Quilts by Jen. She was excellent!! A great trunk show and presentation at the guild meeting Thursday evening, and a fabulous two day workshop. If your guild is looking for a speaker and a workshop, I would highly recommend her!! And now, much as I would love to continue to put this off longer, I really have to do something about that mess. If it gets any bigger, it will start to spill out the back door. All year long, beginning last September, the guild has been working on a Canadian themed row of the month quilt. The program committee met a year ago, and we brain stormed all kinds of ideas of what Canada meant, and what blocks could represent those thoughts. I took those ideas, and built up a design in Electric Quilt 7 based on those ideas. We also obtained permission from Margaret Rolfe to use some of her paper pieced animal blocks in our quilt, and of course, gave her credit for those. The first row is Moon Over the Mountain, for the Rocky Mountains on the west coast of the country. The second row is our Canadian Maple Leaf. The third row is made up of Inukshuks and bears. The bear pattern was courtesy of Margaret Rolfe. The fourth row is called Crossed Canoes, for our Native Indian heritage. The fifth row is barns and silos, meant to represent the prairies. The sixth row is the personal one. The seventh row was meant to be the paper pieced loons and beavers, both very iconic Canadian animals also used by permission from Margaret Rolfe. The eighth row is trees, representing the vast amount of forests that cover our country. The ninth row is actually a variation on the Snail's Trail block, but I thought it looked a lot like waves, so that row represents the oceans that border our country on three sides. Every month I've been sewing up these rows, and writing up the instructions for them. It's been a mystery for the guild members, as they haven't known from one month to the next what the next row will be. The last month's row is being handed out this Thursday. After that, there is one more that they have to make themselves, showing what Canada means to them. Shown here are the top five rows, and the bottom three rows. There is still one more that I have to make. The top row in this set in the picture below, is this months row, and it was supposed to be a set of loons and beavers from Margaret Rolfe's designs. 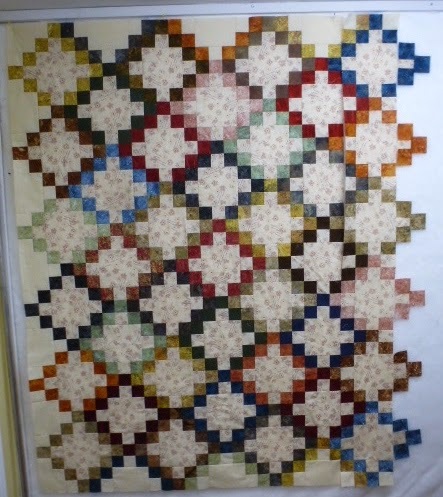 However, there has already been a lot of paper piecing in this quilt, and I really didn't want to do any more. And, we've been encouraging the members to take the basic ideas, and then make the quilt their own, so that's what I did with this particular row. I had some fabric in my stash that I'd used as a backing years ago, that had geese and ducks and loons in it. My first thought was to take that fabric and do the entire row with it. But then I wondered if it might be possible to find other fabrics that would blend with this one that also had animals in it. So, off to Lens Mills I went, and hit the jackpot. and then I found bears and moose. I spent most of Saturday afternoon and evening working on cutting and laying out and then fusing that row. I have one more row to do..... my personal one, and I already have a plan. Then all that's left are the borders. And of course, no Canadian quilt is complete without the Canada goose, so the borders are going to be made up of flying geese. 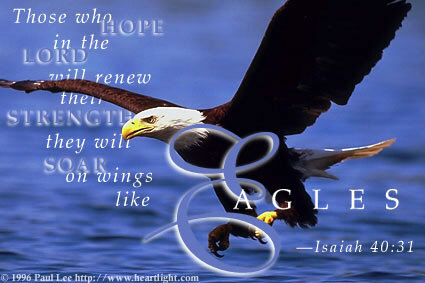 I'm linking this post up to Judy's Design Wall Monday. Then I think it just might be time to play with La Passacaglia some more. I'm continuing to make progress on La Passagaclia, which is a design found in this book. I haven't added any more to the actual large piece, but have focused on making star centres, and rosettes without the outer round of stars. I'm trying out different fabric combinations, and want to get the balance of them figured out, before adding the stars and putting them into final place. These are the results of some of the new fabrics I've gotten in the past month, or so. I also picked up some fabric this past week representing different Canadian animals for a Canadiana row quilt I'm doing. I might even have some pictures of it by tomorrow, for a design wall post. Net stash added: 3.7 yards. I'm linking up to Judy's Fabric report, and to Kathy's Slow Sunday Stitching.